The other evening, TV Patrol aired on its national edition an item on the huge flocks of barn swallows that have become quite the phenomenon in Batangas City. The flocks, in their thousands, attract curious onlookers because of their sheer volume; but they have also been an infestation of sorts because their presence is not necessarily welcome. 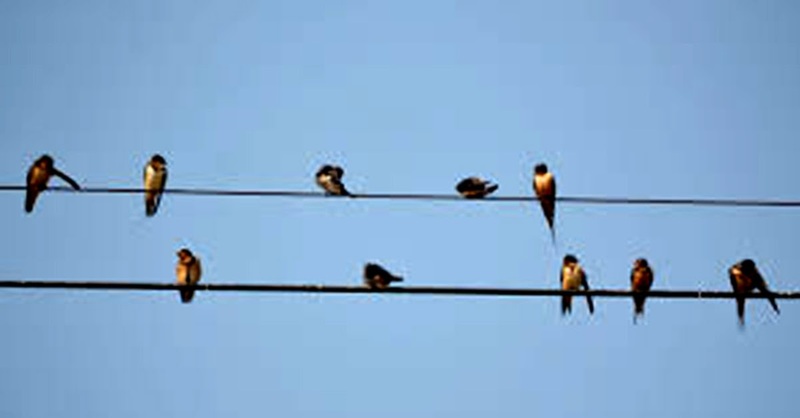 The barn swallows are quite the sight to behold when they perch in neat rows along electrical wires to settle down for the night. On the other hand, they bomb pedestrians and vehicles with you know what. The bird droppings, in fact are so voluminous that local government has felt impelled to regularly send in teams to wash and disinfect the roads. The birds are protected; and while they can be a nuisance, they are by and large also tolerated by locals. The phenomenon is by no means new. I first heard of it two cold seasons back when a former player who now teaches at Stonyhurst International School in Batangas City sent me a text message about how the swallows have started to attract people. At the football field, I would see the swallows arrive sometimes in trickles but sometimes in large flocks by the hundreds. They could be a sight to behold, particularly when they swirled around like a funnel in the sky before the birds broke up to hunt. The specie of barn swallows that visits the Philippines bear the scientific name hirundo rustica. They are known in English as the Common Eastern Swallow or layang-layang in Tagalog. The Tagalog name is actually of Malay origin, as the barn swallow is called layang layang hijrah in Bahasa, the language of the Malays. The birds spend the summer in the temperate zone. Those that come to the Philippines probably originate from China, where they breed during the warmer months. With the onset of winter, the barn swallows start to migrate to Southeast Asia, including the Philippines, often travelling thousands of miles without stopping. The birds are known to have the ability to feed while in flight during migration. While they feed on a variety of insects, the known preferences are flies and mosquitoes. This is probably the reason why I see fewer swallows in Lipa than there used to be; particularly in the area where I live. Animals of whatever the sort are always drawn to food; and the less agrarian Lipa becomes, the fewer insects there will also be that migratory birds like barn swallows will gravitate towards. For instance, when I was a teenager, we used to own a poultry farm behind our house. During the cold season, hundreds of barn swallows could be seen flying around and these would start to perch in neat rows on the edges of the corrugated roofs when they were ready to settle for the night. The question about the volume of barn swallows in Batangas City is, needless to say, what is drawing the birds to that particular area. There must be something in the area that attracts flies or encourages mosquitoes to spawn. These, in turn, must be what attracts the barn swallows. When I was till actively coaching, I could always foretell the changing of the seasons from the arrival of the swallows – sometimes as early as September but mostly around October. Their arrival has always augured the arrival of colder days, something that I have always loved about living in Lipa. When the weather started to get warmer, the same flocks would fly around over the field before leaving for their homes somewhere up north. Their departure always filled me with a sense of sadness the same way their arrival filled me with so much anticipation. 1. Top photo from woodswalksandwildlife.blogspot.com. 2. Information on barn swallows from Barn Swallow.